Simulate your logo design on iPhone! 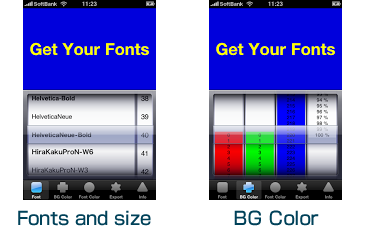 This app enables you to simulate various fonts installed in iPhone. You can set background color with alpha value and export the output image (PNG) via E-mail. It's easy to reuse this image file on paint editor. i.e. (R,G,B)=(255, 128, 1) will be also shown (R,G,B) = (1.000, 0.502, 0.004) at "Export" tab. 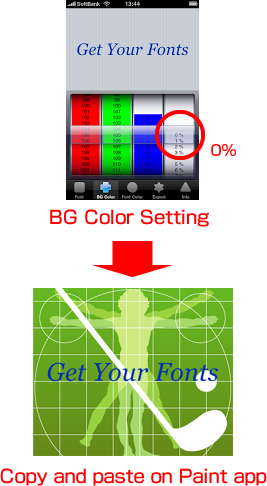 Set the alpha value (right side wheel) of BG Color to 0%. 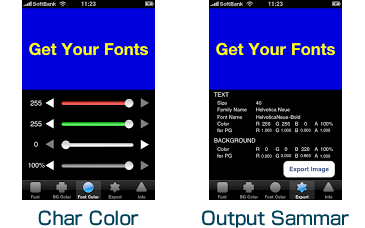 Input characters and set font, size and font color. E-mail PNG from Export tab. Open PNG file with PhotoShop and so on. Copy and paste the characters on the pictures you designed.